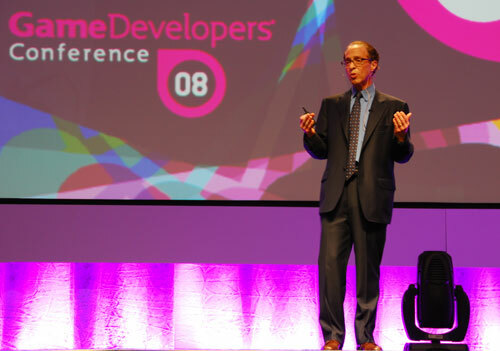 GDC08 Keynote: Ray Kurzweil On Our Technological Future, Immortality by 2023 | OhGizmo! Ray Kurzweil, an inventor (of such things as the flatbed scanner and optical character recognition) and futurist gave the keynote at GDC on Thursday. 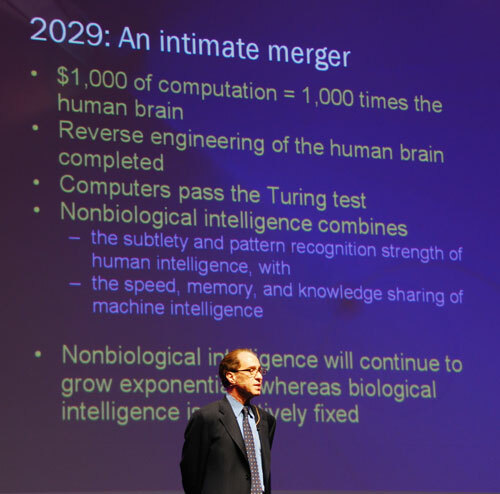 Although the title of the talk was entitled The Next 20 Years of Gaming, Kurzweil spent the majority of the keynote explaining how information technology is advancing exponentially at a steady and predictable rate, which allows us to see where our future lies as a species. The idea that was really hammered home to me is that technologies and advances which may sound like science fiction are actually predictable, and thanks to the magic of exponential progression, much closer than we think. Let me restate what he’s saying: if you can make it to 2023, you won’t ever die of old age. This isn’t just speculation: it’s based on a mathematical model which has been, if anything, conservative. I’m sure there’s an asterisk in there somewhere, but even so, there’s no denying that it’s exciting to think about. More stuff like this, after the jump. Again, these aren’t just idle predictions, they’re based on trends information technology that have remained essentially stable for decades. Kurzweil actually demoed a few language technology devices, including an optical text reader integrated into a cellphone that instantly translates written text into spoken words (it’s designed for the blind) and a vocal translator, which reproduces what you say in the language of your choice using voice recognition, real-time automatic translation, and an almost but not quite convincingly human speech generator. All this makes me want to reread Snow Crash. And The Diamond Age. And Foundation, for that matter. 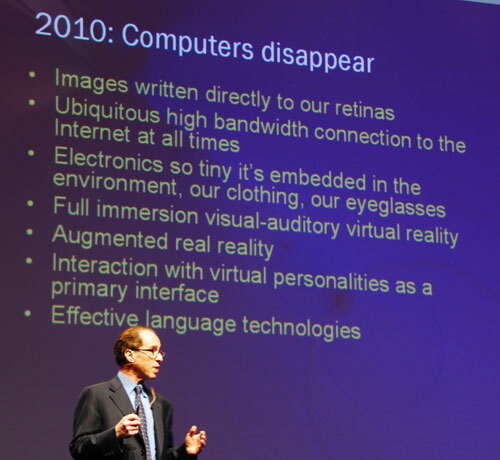 You can see more of Kurzweil’s predictions over on Wikipedia, or check out his website here. To be immortal would be really cool, assuming you didn’t get bored of life eventually. However, lets get one thing straight: death is a GOOD thing. Maybe it’s hard to appreciate while you’re lying in bed with terminal cancer, but death is a necessary part of life. If you take out death, you get extreme overpopulation, infinitely more polution, and the cheating of the already cheated natural selection of humans. There are many other reasons but this is just food for thought. Who will gets th technology that extends life indefinitely? Who will control the technology? Whoever invents it, probably… And we all know how compassionate biotech companies are (!). I just found your blog post and found it quite interesting. If you are serious about this subject, then you will be quite interested in my reasearch and findings on this very topic. Check out the post “Summary of the Facts” whne you get a chance and then my followup book “Secrets of an Immortal – An Eyewitness Account of 2,800 Years of History”.